2. Prizes will be awarded to anglers takin specifically tagged fish and largest 3 fish, by weight, taken during the term of the erby in each of the faollowing catagories: Walleye, Largemouth, Smallmouth, Crappie, Northern Pike, Channel Catfish only, Rockbass and Rough Fish. Only one size-category prize will be awarded per individual. The Derby Commite reserves the right to announce additional daily contests and promulgate the rules therefore by public announcement prior to the date of the contest. Ties decided by date and time of surrender at weight station of draw if necessary. All tagged fish have been officially measured for slot limit and legal length. A tagged fish can only win the designated sponsored prize. 3. Contest open to all amateur anglers with a paid registration of $20.00 per family or per individual accepted by Derby agents prior to 10 a.m. CDT at the agent's principal place of business July 6, 2018. To be eligible for prizes, all catches must be caught by hook and line methods (excludes bank poles, jugs, throw lines) permitted in accord with rules and regulations promulgated by the Illinois Department of Natural Resources and must be entered and recorded at one of the sanctioned weigh-in stations, alive, or in fresh condition. Prizes are limited to fish caught in the Kankakee River or its tributaries in Kankakee and Will Counties, Illinois. 4. 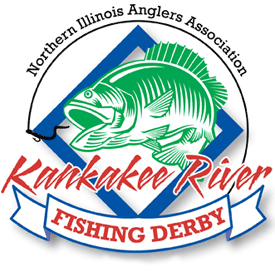 Officers and Directors of the NIAA and Kankakee RIver Valley Fishing Derby Comitter members participating in fish release, are inelegible for prizes. 5. All contestands must have paid an entry fee and have a completed entry form signed by a person of legal age ON FILE AT LEAST 24 HOURS with the Derby Committee to be eligible for prizes. Family registrations include the registrant's spouse and natural born minor children, adopted minors, or any minor child whom the registrant has assumed legal guardainship. 6. All information must be legible concerning the fishermen's name, age, fish caught, weights, etc., shall be the property of the Northern Illinois Anglers Association. 7. Entries will be judged daily with the distribution of prizes on Wednesday, July 11, 2018 at 6:00 p.m. at Bradley-Bourbonnais Sportsman's Club. Winners, or their appointed represenatives must be present. 10. Tagged fish caught after weigh stations are closed must be called into (815) 802-5030 - leave a message with name, phone number, fish species and tag number, aproximate size and where caught. The fish must be surrendered to a sanctioned weigh-in station prior to 8:30 a.m. the following morning by the person who caught the fish. Failure to follow these requirements may cause the catch to be considered ineligible for prizes.